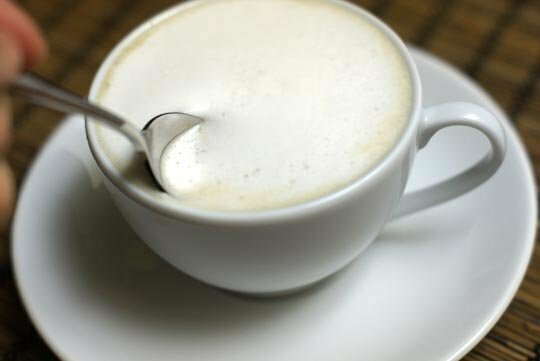 If you’ve ever tried using store-bought almond milk in your morning coffee, you probably know that it doesn’t make a very good “creamer” substitute. It can curdle, it can separate, it can taste like preservatives… really, nothing that you want in a coffee creamer. Homemade almond milk, on the other hand, tastes amazing in coffee. Especially with my latest discovery–> blending in coconut oil! It’s coffee creamer with benefits! Combine all ingredients into a high-powered blender, and blend until very smooth and creamy. Transfer the almond milk to a sealed container, and store in the fridge for up to a week. Note: Freshly made almond milk produces a lovely foam, perfect for making a latte or cafe au lait, if used right away! A creamy, non-dairy alternative for serving with coffee or tea. Position the nut milk bag over a large bowl, then pour the blender contents into the bag to strain. Hope this creamy tip makes your morning a little brighter! Reader Feedback: Are you a coffee or tea drinker? 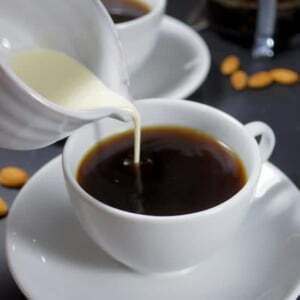 Do you add cream to your morning beverage? If nothing else, I hope you’re inspired to make your own almond milk if you haven’t tried it already. It’s so easy, and so much tastier! Hi I made this and then when I heated the milk it separated, curdles. Any suggestions for this? Hi why do some recipes pee their almonds for milk ? I haven’t made almond milk before as been using coconut milk but it’s not nice in coffee . Oh my goodness, you saved my life with this! Thank you!!! What do you think about pasteurizing this? I have a sus vide I can use but would it compromise the texture? I just need it to last longer for nitro coffee in a keg (takes a few weeks to go through). I haven’t tried that! The only thing to keep in mind is that sometimes almond milk gets thicker when heated, so I’d try it but maybe be prepared to add more water if needed. I’m sure some of the recipes could be adapted for the slow cooker, but many of the two-dishes-in-one-pot options won’t work. I tried to take fully advantage of the Instant Pot by cooking the main course and side dish (like rice or mashed cauliflower) in the same pot. If you don’t mind cooking things in two pots, I’m sure you could modify the recipes to be made on the stove top or slow cooker. My favorite almond pulp recipe is in my first book, Everyday Detox, if you have it. The Almond Pulp Hummus uses it “as is” directly after making the almond milk, so it’s super easy to prepare. And it’s one of my favorite hummus recipes– we make it almost every week! Thanks so much for this. I just actually made myself a latte with cows milk, even though I am trying to avoid dairy, the nut milk just isn’t the same. I will try this tomorrow. Love this, I have been making it for a few weeks now. Question-(I hope) this is 265 calories for the whole recipe and not each serving right? Yes, definitely not per serving! Just made this. AMAZING texture, taste, no added sugar, and none of the preservative junk. Thank you for this coffee- (life? ?-) changing recipe. My Ninja blender is not strong enough to liquify coconut oil (which is solid at room temperature). With some trial and error I figured out a quick 30 seconds- 1 minute in the microwave or on the stove on very low heat renders the oil into a lovely clear liquid that then emulsifies nicely with the milk– no separation problems. It just needs to melt– no boiling! Also read somewhere else that (believe it or not) paint strainer bags, available in the paint section at Lowe’s or Home Depot for a whopping $2-3, work wonders on straining almond milk and they DO. The mesh is fine and slippery enough that it strains like a charm and the pulp doesn’t stick to the fabric– comes out in one easy-clean up ball. In addition, the bags I found have an elasticized rim; so it can slip easily over a large measuring cup, for example, and doesn’t collapse into the bowl while you’re trying to strain the milk. Hi there. Thank you so much for this recipe. I am soaking my almonds as I type. I purchased organic non pasteurized almonds and was curious if they still needed to be soaked. A lot of websites I looked at said they do and that they should be soaked in filtered water with salt. I am curious if you soak your almonds with salt and if you know why one way or the other. I’m a little late to this party, but…. I can’t wait to try this!! My question is- have you ever tried coconut cream (from the canned coconut milk) in your homemade almond milk? I wondered if that would be creamier than coconut oil or if anyone had any results. Thanks for the tip and have a good day! I switched to canned coconut milk in my coffee when I went dairy free … it’s OK, not great, but gets the job done. I like that the fat in it sustains me for the morning but it doesn’t have the creaminess/mouth texture that my heavy cream does. Dairy is now a big no-no for me so I make do. I personally don’t like coconut oil in my coffee but did use it in the past for its health benefits (I continue to use it in other recipes but just don’t care for it in my coffee unless I mix it in with some ghee or irish butter and whirl it up in my blender to make it frothy). I’ll have to give this almond milk recipe a try based on the reviews. I’ve tried store bought nut milks as alternatives but they didn’t do much for me. I just made this from your book. It is so yummy and just the recipe I needed! I used cashews because that’s what I had and it was yummy. The book has instructions for turning this into french vanilla creamer. I am wondering about vanilla bean powder. I thought it may be extra tasty instead of vanilla extract. Do you have any thoughts on that? A lot of paleo recipes call for a vanilla bean but vanilla bean powder seems much more convenient, except I never see it mentioned. I think I will try not adding the coconut oil until after I strain my almond meal because I always make flour out of the meal. So easy in the oven but I’m afraid with the oil mixed in it may burn? Any thoughts on that? I won’t be making this til next week when I shop for almonds so I can’t experiment yet. I keep having the separation issue in my tea, I never thought to add coconut oil but that is genius! Will definitely be trying it out soon. I have a mate late recipe I’m working on and need to figure out how to avoid that separation! Do you blanch your almonds before soaking? I’ve done that once only and although it was a breeze to strain, the milk separated significantly and curdled in my coffe after a few days. This hasn’t happened with un blanched almonds but straining through cheesecloth is quite a mess! No, I usually just use whole almonds. Having attempted many non-dairy creamer creations, I wonder if you have actually used this. There won’t be any similarity to using dairy half and half and a batch this size will have a different result in your coffee after sitting in the refrigerator for several days – it will separate and look unappealing. This recipe would result in a very thin and watery “creamer” due to the high amount of water versus the 1 cup of almonds. I love creamed coffee but otherwise avoid dairy. Commercial non-dairy creamers are too sugar laden. I really do wish there was decent solution. I tried using guar gum to better emulsify this and I’ve tried coconut milk using full fat canned, tetra boxed coconut milk, and the homemade version. It’s back to the creation counter I guess. It sounds like you haven’t actually tried this recipe? I enjoy it regularly in my coffee, and it definitely provides the creaminess I love! I’d luv to have an almond based creamer for my coffee without the coconut oil, for those of us O- blood types who want to stay away from coconut ingredients… Hmm…maybe I’ll play around! When I first gave up milk I started drinking almond milk. I hated it in my coffee but loved it in everything else! Then I found an almond/coconut blend milk! It’s awesome in my coffee, so this creamer should be outstanding! Thanks for another awesome recipe! Coffee creamer has been my weak spot in several instances, and I’m really grateful to be able to have a healthy alternative. Mine only lasts 3-7 days, probably depending on the emulsion, so I’ve been making it in small batches. It’s worth it! I added vanilla, and have also used chopped/soaked dates for sweetener, based on another website’s recommendation. Hey .. I been doing this about two weeks now, but still trying to get a more ” cream ” look and taste.. so this sounds like something I really want to try!, I also add Dates to my almonds and Vanilla as I used to drink my coffee with Coffee Cream and 2 spoons of sugar !! and I have replaced it with just the almond milk ! and I am a NEWFOUNDLANDER ! you know how we love our coffee and cream! haha .. but could you maybe suggest some brands of the coconut oil we could look for or try? for some reason I am not picturing it in my head ! Thanks so much and I am glad I found your site ! I just made this with hazelnuts, it is amazing! It’s very creamy, more so than the store bought dairy alternatives. What a great blog, there’s so many great recipes I’m excited to try! I discovered Tropical Traditions online. I buy my Coconut oil (gold), shredded flakes and to die for Coconut Cream Concentrate aka coconut butter. I typically make my own coconut milk from the shredded coconut. I’ve been putting a little bit of oil in my coffee and tea for ages. So healthfully good for your body. My blender isn’t really very good. I’m afraid of putting nuts in it. Can I make this in a food processor? That kitchen gadget of mine works like a charm. Thanks! I use a cuisineart smart stick attachment (the chopper), and it works ok depending on the almonds. I think a stronger motor would definitely help, and if you can avoid almonds with the peel attached, it’s even better. I used Trader Joe’s sliced almonds (no peel) and it was a lot easier than whole almonds. I made this creamer this morning and it’s delish! For my tastes I did add a few dates, some vanilla and some cinnamon. No more store bought junk for me. Thank you so much! Where can i get coconut oil from? Can i use tinned coconut milk instead? No, coconut milk is not the same as coconut oil. They have totally different properties. Even in small towns now you can often find coconut oil at regular grocery stores… I’d check the health food section first. I have just made almond milk for the first time. I started with just a few soaked almonds as a test and put them in the blender whole. I got a slightly brown milk, so for the second batch I skinned them first. The skins come off easily and the milk strains more easily too. I only do a handful of almonds at a time as I don’t need much milk. I also added just a tiny pinch of celtic salt. I used the milk in cocoa and it did look lovely and frothy. Cocoa is already rich enough for me so I didn’t add coconut oil. I have just bought some organic coffee beans as a once a week treat, so I look forward to trying it in that. The milk has a fairly bland taste but definitely a good substitute for cows milk. I only used a silly little hand blender and a little kitchen sieve but it worked OK except that I did get a bit of nutty sediment at the bottom of my cocoa. But that’s OK. I am trying to eliminate dairy from my diet (little by little) and in the process I am trying to find alternatives. I am one of those who can’t drink black coffee and I came across your recipe. I was skeptical when I read it, but I thought “oh well, I’ll give it a try anyways…” and boy, was I pleasantly surprised! I never thought I would say it, but here we go: “it’s better than the dairy creamer! !” I am so happy to have found it. I dry the almond stuff left behind to make almond flour and I’ll use it to make almond bread. Thanks so much. God bless you! I have been adding regular homemade almond milk to the blender with my coffee and a tablespoon of coconut oil, and that has been delicious, too. That way I can still use the regular almond milk in my protein shakes, but combine it with coconut oil for a creamy coffee.